Kezmarok, often called pearl lying under Tatras, is a nice Slovakia city situated in eastern part of Slovakia country. It is the centre of the Spiš Region and often it serves as a reference point to other historical places: Spišská Kapitula, Spišská Nová Ves, Levoča, Spiš Castle; or to mountain ranges: High Tatras, National Park Pieniny and Slovak Paradise. Kezmarok used to be a royal city and it was a centre of forty handicraft guilds. Nowadays it has about eighteen thousand inhabitants and visitors will find here a complex of valuable cultural-historical monuments. One of the most precious ones is the Evangelical Wooden Articular Church. The Wooden Articular Church is located next to the Evangelic Lyceum and new Evangelic Church. 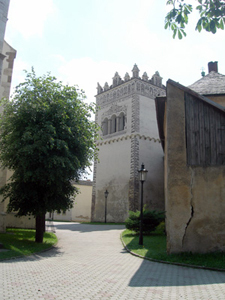 Originally built without any spikes, it belongs among the only five churches of its kind in Central Europe. Since 2008 it has been inscribed into the UNESCO World Heritage list. Constructed in times when Protestants were persecuted, the Church has acquired the shape of a Greek equilateral cross. The original church constructed in 1688 had probably the floor plan similar to today’s church. It was rebuilt in 1717 when it acquired the today’s look. Its outside appearance may not catch the passers-by’s interest, you have to enter the door to admire its prettiness. Its beautiful Baroque decoration ranges first among the five preserved wooden churches. A sacristy is the only stony part of the Church..
A unique building of Evangelic Lyceum shelters the biggest historical school library in Central Europe. It keeps about 150,000 books. There can be found 53 incunables in its depository (books printed from the invention of typography in 1444 till 1500). The Lyceum houses the biggest collection of print in Slovakia. It makes about 2,600 books only from the sixteenth century. The Lyceum was established in 1531. It distinguished by many outstanding European teachers. Its famous alumni: Pavel Jozef Šafárik, Samo Chalupka, Ján Chalupka, Janko Kráľ, Martin Rázus, Ivan Stodola, Jonáš Záborský or well known Slovak poet Pavol Orzságh Hviezdoslav were a positive proof of a high quality education at the school. 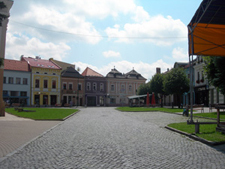 Gradually connected Main and Castle squares are considered to be the historical part of the city. It has a triangular shape. Evangelical part with churches and the Lyceum are situated on one side, the Castle lies on the other side. Church Square with the St. Cross Church is located between the Castle and the Evangelical buildings. A walk around the historical city part will allow you to admire Ridotto and Town Hall. The Town Hall was destroyed by a big fire during the sixteenth century and a new one was constructed in the Renaissance style on the same place. The classical building of Ridotto was constructed in 1818. It houses the town’s library and a cinema. Streets with typical mansion houses are also very interesting. The house No.55 on the Main Square is home to a permanent exhibition of burgher’s interior design and culture. Historical city centre ends up with the Castle looming over the city. The St. Cross Church was built during the fourteenth century and it belongs among the biggest churches in Slovakia country. This three nave basilica is a Roman Catholic Church. It houses Late Gothic altar originally from the sixteenth century. A Renaissance bell tower situated next to the Church constructed in 1591 belongs among the most beautiful bell towers in the Spiš Region.